StoryWalk™ is back by popular demand! As of June 21st, this year’s book is on display along the wide path of the Lower Loop. It’s geared towards 3-6-year-olds, and offers a combination of outdoor adventure with an engaging story. For this summer, we have chosen Denise Fleming’s book, “In the tall, tall grass.” The story is deconstructed, page by page. Each page is displayed along the trail, where children, parents, and friends can walk from page to page in anticipation of what’s next. The interactive activity combines reading, walking, and observing the natural surroundings. StoryWalk™ is brought to you by the Crested Butte Land Trust and the Crested Butte Old Rock Library. Special thanks to the Paperclip and True Value for providing the supplies and labor needed to make StoryWalk™ possible. The StoryWalk™ Project was created by Anne Ferguson of Montpelier, VT and developed in collaboration with the Vermont Bicycle & Pedestrian Coalition (VBPC) and the Kellogg Hubbard Library. 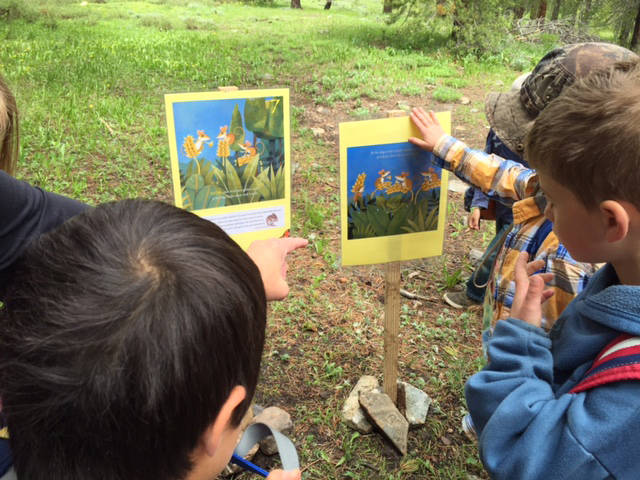 For more information about the StoryWalk™ program, contact Hedda at preserve@cblandtrust.org, or at 970.349.1206.